I first came across the Dragon Warriors books as paperbacks, in 1991 or thereabouts. I think that I initially mistook them for Fighting Fantasy style gamebooks, which were released in the same format, and were very popular at the time. I swapped books 1 and 2 from a friend - in exchange for Deathtrap Dungeon and Trial of Champions, if I recall correctly - and later borrowed books 3, 4, and 6 from a local library. I never did get hold of book 5. Dragon Warriors blew the doors off my tiny little mind. All images in this post are from the original Dragon Warriors books and its Blood Sword spin-off series. I'd read Fighting Fantasy and Tolkien and Eddings and Brooks and far more Dragonlance novels than can possibly have been healthy for any one human being, and from them I'd absorbed the basic premises of generic high fantasy, but I'd never seen anything like Dragon Warriors before. Its dark, fearful, cobwebbed world of superstitious villagers, guttering torchlight, dripping forests, barrow mounds, and shadows on the mist immediately seized hold of my imagination, and has never really let go. That D&D5 module I wrote the other month? With all the fog and the curses and the creepy pagan idols? Pure Dragon Warriors. I was used to thinking of goblins as disposable sword-fodder and slapstick comic relief: Dragon Warriors gave me goblins as wicked fey who came creeping out under the cover of dusk, wielding swords made from icicles and nets of spider-silk. Boggarts who danced along the moon-beams. Two-headed trolls that gibbered to themselves as they loped across the moors at twilight. Amoral, soulless elves who cast no reflection in mirrors. 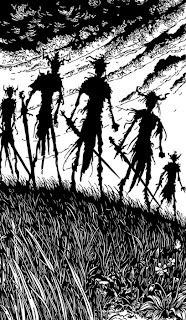 Wights who came drifting from their barrow-mounds, cold and pale and sad, to slay their victims and sow their corpses in the earth. Kings slumbering in hidden chambers beneath the forest. Knights placing the fingerbones of saints in the pommels of their swords to grant them power over evil. Skeletons clawing their way out of their own graves, furious at being buried in unconsecrated soil. I'd never read anything like it, and its distinctive, atmospheric blend of modern fantasy and medieval folklore absolutely enchanted me. When I finally read TSR's Ravenloft stuff, some years later, it seemed like pretty small beer by comparison. A while back, the publishers of the new version of Dragon Warriors, Serpent King Games, put their core rulebook up on Drivethru as a Pay What You Want product, so I picked it up. The rules and the setting were the same, but the effect was completely different. The old black and white art had been replaced with more generic fantasy illustrations. The rules for the monsters were the same, but the monster descriptions had been cut to the bone, with no mentions of goblins making swords out of icicles, or pazuzus posing as 'forsaken lazars', or any of the other details which had so captured my imagination all those years before. The new sample adventure was... well, it was alright. But it didn't compare very well to the old ones. I should make clear, here, that large chunks of the new Dragon Warriors book is copied verbatim from the old ones, including all the wonderful magic items. (I've never really cared whether one of my PCs found a wand of magic missiles or not, but woe betide the NPC who stands between them and ownership of a Ring of Red Ruin!) And there is a separately-published bestiary book, which may well contain all the original monster descriptions. Overall, though, reading the new version of Dragon Warriors made me realise just how much of the effect of an RPG is communicated not through facts - these are the rules for armour, this is how many hits it takes to kill a goblin, and so on - but style. 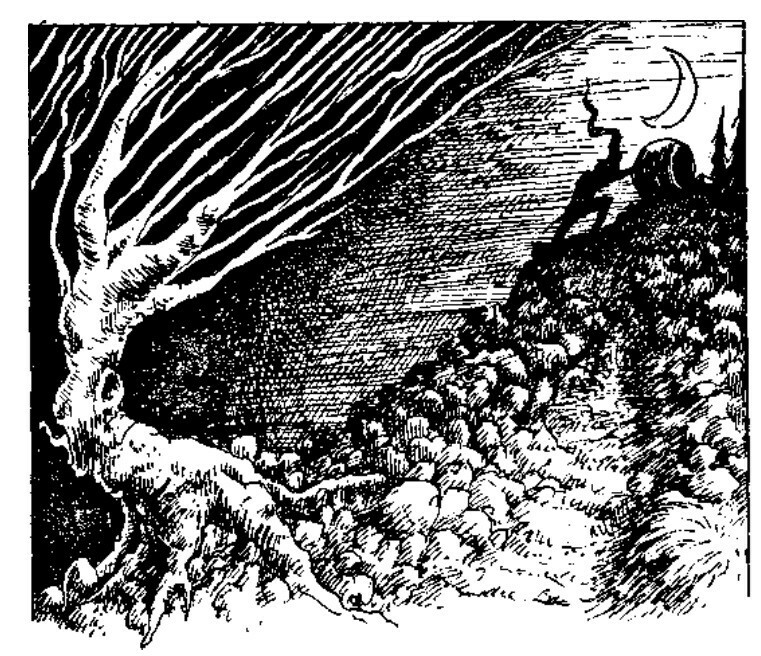 The feel of the Dragon Warriors world, its distinctive claustrophobic folk-horror vibe, was never really reflected in its rules: instead, it was communicated through the language, the illustrations, the sample adventures. Whenever the new version keeps the facts but changes the style, most of the value gets lost along the way. Those throwaway lines of description in the original monsters section have influenced me more than any set of rules or mechanics ever could. I strongly suspect that half the RPG edition wars one sees being fought on the internet only pretend to be about factual changes to rules and settings, and are actually mostly about changes to the style in which they are presented. I don't say that to be dismissive: I actually think that style is at least as important a part of RPG writing as game or setting design, and quite possibly more so. (Any setting can be made boring if it gets described in a boring enough way, after all!) 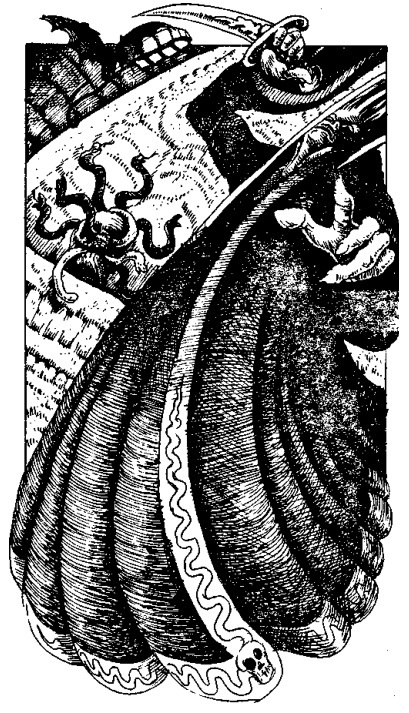 One of the strengths of a lot of current OSR stuff is that it foregrounds art and prose style in a way that is now much rarer in the works produced by, say, Paizo or Wizards of the Coast. The distinctive styles cultivated by individual OSR creators won't necessarily appeal to everyone, and may indeed alienate more people than they attract. But when they win, they win big. They win people over the way Dragon Warriors won me over in 1991. That's a great point. Every game and supplement has an implied setting - generated by the rules, the art, the prose. It's something I have noticed and attempted to perfect in my own just for fun RPG writing. This is very well said - and made me interested in picking up the original Dragon Warriors. Which volumes are worth owning? And are the adventures good? Book 1 had the main bestiary. There is *a* DW bestiary available on RPGnow, but I don't know if it's the same text. There were good, atmospheric adventures in books 1, 2, and 3. I think they've now all been republished in two new books - 'Sleeping Gods' and 'The Elven Crystals' - with what I presume is the same text, but I think they all have new art. So I guess 'books 1-3' would be the short answer. I never found book 5, though, so I can't say how good or bad it might have been! Provided that the French edition was divided the same way the English original edition was, Book 5 had its first section dedicated to Elementalists - I liked this class for they could rapidly get powerful spells in their main "element" (they had to choose one main element, and this choice triggered minor powers in the two secondary elements). Rules were provided as well for "Darkness Elementalists", i.e. evil sorcerers. There was a short section on Madness. The bulk of the book was dedicated to a long quest in Glisson, a small kingdom north of Erevorn, whose target was to save the world from the awakening of Darkness God Balor. If I still had the opportunity to run roleplaying as a GM, I would still use Book 6, which had simple rules for sea voyages, for the background of characters and a new bunch of interesting curios. Book 4 is interesting as well, because of its bestiary (rarer monsters, but still with good description) and of the last adventure where the players have to choose whether they help a wizard or the noble who wants to get back his castle. The French edition of the original version was divided the same way as in English (I got all versions). The only think is that book 1 in French was not as complete in terms of exemples of play. i love dragon warriors! but you can go back and just track down old books. But it wouldn't be the saaaaaaaaaaaaaame! I would like to know more about this as well, if I were just to get one book should I get the first one? I'm really intrigued by what you're talking about with the way they describe monsters, especially the fey. Book 1 had the main bestiary, yeah. And most of the fey stuff is unsupported by actual rules - it's just in the description and the 'fluff'. And on style, it really makes a difference. WH40K Dark Heresy uses a d% system I'm not very fond of, but it's just so dark and cool and... chunky somehow. It just has the right kind of "weight" and feeling. The thing with the DW books (I still have my originals) is that each one presented only a slice of the game, and each built on the previous one. So if you get one, it must be the first. Just be aware that this only has rules for adventuring as a warrior (specifically a knight or barbarian). I still own the 6 books (in their French edition); indeed that was the first RPG I ever owned because it was sold in a gamebook format you could get at the local supermarket. As author Dave Morris himself admitted, this format contributed to give them some appearance of "low quality". IMO, they are not my favorite ones, as my personal taste goes to the more developped Warhammer Fantasy (and if I hadn't Warhammer, I think I would switch to Savage Worlds) but they would still rank in the middle of the quality scale after all these years. That's the perfect system for beginners, for the rules were rudimentary but they do their job. There are enough character classes to keep your players interested (and I added "thieves" from the gamebooks), as you wrote the monster descriptions were great (though I suspect my French version too often watered down the English original) and I'm still in love with book 6 describing the universe of the Lands of Legend ("Terres de Légende" in French, Dave told me that, there, he preferred the French name over the English "Dragon Warriors"). But I regret that most adventures were dungeon crawls lacking originality (except for the adventure of Book 6 and the last one of Book 4, which includes a magnificient esoteric labyrinth). And - last but not least - this series served as a background for the splendid quest of "Blood Sword", considered as ones of the best gamebooks ever written. Yeah, Blood Sword was amazing. I don't think the Dragon Warriors rules system was ever very good at... anything, really. It was quick and easy to pick up, but I feel it compares poorly to Warhammer Fantasy Roleplay, which came out just one year later, and did a much better job of reflecting its setting through its rules. The strength of DW was always in the writing, art, and world. Right. Fortunately, long ago, I had a small bunch of merry players, and though the adventures I made them play (n°1 of Book 2 and n°1 of Book 3) were not very interesting per se, we often ended up with laughter. n°1 of Book 3 was a total failure for my players : one of them was a low-ranking elementalist and used his spells to communicate with... flowers. Later, they got wounded by a giant bee. One of their companions fell into a pit-trap, and when they wanted to rescue him (impaled on a pike and bleeding to death...) they realised he was the one carrying the rope in his haversack. Finally the rest of the party got massacred by an old sadist wielding a battle-axe. My players were laughing to tears... And Dave Morris had much fun when I told him later this absolutely failed forest walk. Book #4 also had the Assassin career in it, which fascinated me utterly. Totally agree. DW has no generic "thief" class, but instead has this class representing membership in one of two very selective and setting-specific societies. Of course, they were cool as hell, and you could easily hack out a more general rogue class. But see my first point - why would you want to? I adapted the rules found in "Blood Sword" for the thief into "Dragon Warriors". However, it remains very close to an assassin. For future reference, the Bestiary *does* indeed contain all the juicy flavour that was present in 'Dragon Warriors' and 'Out of the Shadows'(including the bit about Goblins wielding swords made of icicles). The art style is very different to what was in the original Corgi edition, but I personally find that I don't mind them as much now, and some of them do reference the original pictures from time to time (eg The pictures for the Thorn Demons from 'The Elven Crystals' and the Winged Snake from 'Out of the Shadows' have their clearly inspired counterparts in the Bestiary), which I think is a nice touch - calling back to the game's roots, in a way. Thanks - that's good to know! Love this post. It made me want to track down the remaining old books, since i only own the first two. And i concur, the grim art and the atmosphere it evokes is something alluring. What's happening at the wizard's conference?